Jillian Undercover: My Interview With Erin from Thanks I Made It! My Interview With Erin from Thanks I Made It! Ola lovelies! Chin up, it's Fridayyy!!! 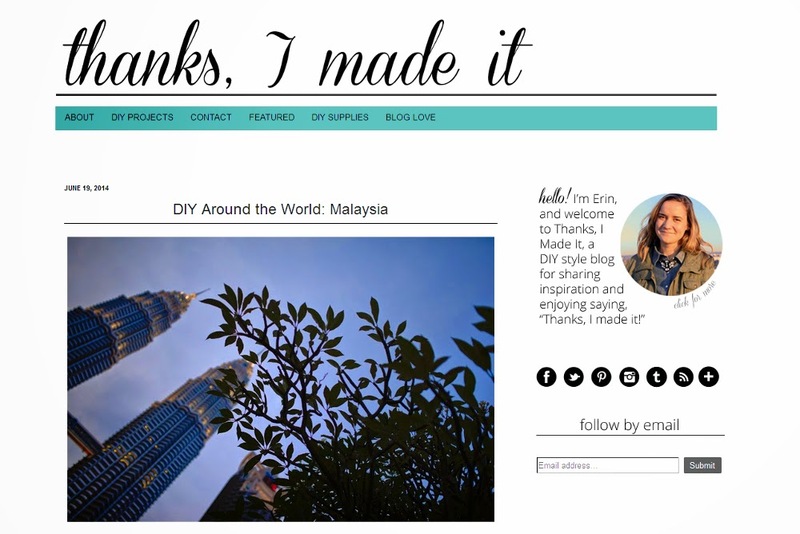 I recently collaborated with Erin from Thanks, I Made It, an awesome DIY blog based out of Washington, DC, on an interview about DIY-ing in Malaysia! We talked about the sort of materials that are available in Malaysia, where I go to source my materials and the challenges all those who love DIY-ing face in this country. I also gave a brief introduction about our lovely countries, you know, just to put our nation out there a little. Head over to Thanks I Made It and read the article now. She's got a ton of really sweet DIY ideas. I especially love all her tutorials on making your own jewelry. So much love! All images by Moose Pixels.